Now, before you start panicking about the shallowness of the armholes like I did, I should point out that there was no armhole shaping on these pieces. The shaping is for the neckline, and I just happened to lay out the pieces in a deceiving way. 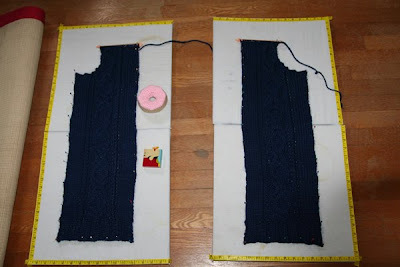 I am a little embarrassed to admit how many times I frantically remeasured my "armholes" and mentally compared them to the size of my arms before reading through the entire pattern again and seeing the words "neckline shaping." What a relief! I think this sweater may actually be long enough. Almost every sweater I have knit has ended up being just a wee bit short. In most cases I didn't notice it when it was first completed, but it became apparent when I actually started wearing it. Recently I went to a brunch with a whole gaggle of knitters and a few of us starting talking about this phenomenon. Wise knitter Grumperina recommended knitting until you think the sweater is long enough and then knitting at least two more inches, because it is so easy to make a sweater too short, but almost impossible to make it too long. They always seem to stretch in width but, alas, never in length. I knit a couple of extra inches in length on this sweater and my hope is that when I sit down while wearing it, I will not feel a breeze on my back.